There are many myths surrounding Tarot cards, because they are linked to the psychic and mystical arts. When you first started reaching out to learn about Tarot cards, there are still many myths online about Tarot dos and don’ts. Thankfully, many of those myths are debunked via experienced users sharing their views. Here are eleven myths about Tarot that I have heard that is definitely not true. If you do not let other people touch your cards, you cannot perform a Tarot reading for them. Tarot card readings require the querent to ask the Tarot a question whilst shuffling, that is standard practice. Tarot cards are tools, they do have better links with you, the owner. But they are not sensitive enough to absorb other people’s aura and ‘betray’ you, like what some people say. Letting a friend or someone touch the Tarot to admire them before asking a question is helpful, it links the person asking to the Tarot, and will help establish rapport. Trust is important in a Tarot reading, and touching Tarot cards to see that it is harmless will help. I scoff at this statement, because I do not consider myself a psychic. Tarot cards are a method of communication between you and your psychic guide, which is why you do not have to be a psychic to read one. However, you do need to learn how to understand your deck and your guide. Learning to read Tarot cards is like learning how to read, it takes practice and patience to understand your deck well. Tarot cards are not for psychics only, it is for everyone who seeks guidance from the Universe. There is a deck for everyone, but it does take perseverance to achieve good communication and reliable reading. Tarot cards are not magical nor evil, it is just a deck of cards specifically drawn to represent something. You cannot summon the Devil with it, nor it will grant you wishes. If you believe that Tarot cards can absorb magic or accumulate evil spirits, you might have to watch less horror shows. They are helpful tools to communicate with your Spirit Guide, and provide some answers. The Universe is a neutral ground, and your personality can affect your decisions and outcomes. Seeking answers from Tarot card readings is not wrong or evil, it simply means that you are concerned about your future enough to seek alternative routes. We are not perfect, and we do need to change our mindset to make ourselves better sometimes. Tarot cards can help us become a better person, not through magic, but by understanding ourselves better. From having to wrap them in silks to storing them in special wooden boxes, you will read a lot of these special storage conditions when you search online. Truthfully, as long as you keep them in a safe place, away from moisture and flame, your Tarot cards will last a long time. There is no need for special storage, unless you have a flair for drama. You do see certain Tarot card readers keeping their cards in a beautifully decorated container, but that is their choice. It is their way of appreciating their deck, it is not wrong, but unnecessary. Tarot card readings are not always accurate, mainly because they are many factors that will change the outcome. You could have been highly emotional when you were making the query, or you might have changed your mind since asking your Guide what to do. Tarot card readings are a guide only, so it does not always have to be right. But if you are always wrong, then it might be worth considering what went wrong. Card spreads, emotion or not asking the right question can make the reading biased, and unhelpful. It does take practice to know which questions to ask, but the Tarot card is not always right. This is not a strict no, but there is a reason for this myth. Many pregnant women are highly emotional at this stage, and this may affect the Tarot readings. Plus, you cannot guarantee that Tarot card readings are always right, thus inviting wrath from an emotional person. Usually pregnant woman seek guidance from Universe about their unborn child. Although it is not wrong, it can be tricky to navigate between personality of the mother and child. If you can, try not to help an expectant mother perform a read, mainly because it may invite an unwelcome headache. Future mothers can worry too much, and sometimes some reassurance and emotional support is better for everyone’s sanity. This is a myth worth debunking, because there is no bad news in Tarot readings. There are seventy eight cards in a tarot deck, and therefore 156 possible answers if you count the reversed cards. Reversed cards are warnings, or a description of a personality, we are not perfect, and a reversed card shows us our flaws. Accept a reverse card for what it is: a warning or an indication of your flaw. It is not bad news, but rather your Guide telling you to change for the better. It will be your loss if you ignore what the reversed cards have to say, because the world is not always a bright and shiny place. The Death tarot card does not mean end of life, it means end of something. It can be the end of a phase of your life, thus it signifies a major change. It can be a sudden change, and is significant enough to make you hesitant and afraid. Having a death card upright symbolizes that a change is coming your way. But if the card is reversed, then you are having trouble accepting the change and is resistant to it. Although a myth, it is not without its merits. When you read your own spread, your emotions may come into play, thus making you biased. You might insist on seeing what you want to see, but it might not be the answer that is given. Based on this, most people prefer to consult a teller, as there will be a non biased person reading the deck. If you are not emotionally affected, then reading your own fortune is perfectly fine. If you do not trust everyone else, make sure that you perform deep relaxation techniques before performing a read. Alternatively, record on your journal all the details and revise them later. You might come across a different answer then . A myth that originates from people saying that Tarot decks have to be gifted to you. I bought my own tarot deck, being attracted to it at first sight. If I were to wait until someone gives it to me, I will never have owned any. Buying your own Tarot deck is better, because you choose the deck that talks to you. 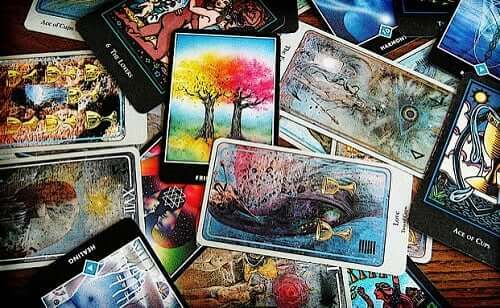 There are people who have many Tarot decks, gifted or bought, and I have not heard that one deck will perform better than the other. This is definitely a myth when it comes to Tarot deck ownership. There is no evidence in history that says gypsies invented the Tarot, but it was a popular link. Although the exact origin of the Tarot is unknown, the popular belief is that Tarot evolved in Europe around the 15th century. Before Tarot become a common consumable, it was generally hand painted for aristocrats. Commoners got wind of it and it became a popular item after that. Other myths include Tarot cards originated from Egypt, but that is found to be untrue as well. We might never know how Tarot cards came about, but it remains a helpful tool for fortune telling. There are many more Tarot myths circulating around, some are funny, some are rude. It is important to filter out what is true and what is not. Myths are fun to read, but it can cloud your judgement, particularly when you are unsure if you want to be an owner of a new Tarot deck. Tarot cards are beautiful, and if you are sure, a wonderful companion tool to communicate with your spirit guide.